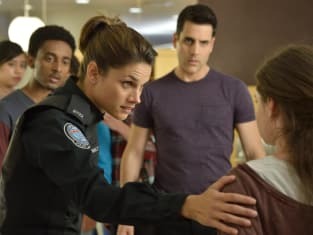 Let's face it: we all knew that the dirty cop who set the bomb in the evidence room just couldn't be Oliver Shaw - but it took Rookie Blue Season 6 Episode 7 to confirm it. Still, the true shocker was finding out who the real culprit was. Even when all of the evidence pointed toward Shaw, not one of his friends or colleagues believed it. Of course that didn't mean that Commissioner Santana wouldn't bury Oliver, especially if the commissioner himself is part of the cover up. As Oliver worked tirelessly to save a missing boy, his friends never let up on an investigation to clear his name. Unfortunately, what they find just seemed to lead right back to Oliver when Chris Klem swore that a police officer named Oliver Shaw was the person who bought the explosives that were used in the evidence room bombing. The impending cover up sent Klem and his daughter on the run and in fear for their lives. But when Chris Klem sees a picture on Traci's cell phone, he swears that it is the man who claimed to be Shaw...only it's someone else working at 15 Division. Want to find out who? You need to watch Rookie Blue online here at TV Fanatic.